I’ve been away from Exit Only for 3 months. Back in the USA, I have been getting back to my medical career as a physician assistant and somehow surviving on emails from David. So a little break was well deserved once Exit Only had arrived in the Caribbean. 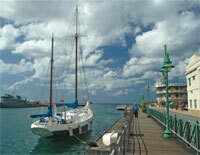 Time to jump on a plane and head down to Bridgetown, Barbados. If only it was that easy!! The whole month of December was packed with last minute travel planes to see family across the US and in Europe. I got back from Washington State on a very late flight. After 4 hours of sleep, I would have to head up to Cincinnati for a 7 AM flight. No problem, right? Somehow, in my sleep deprived state I didn’t wake up on time. When I finally woke up at 530 AM, I flipped out … what was I going to do? There was no way that I would make it up to Cincinnati in time to catch the flight. So I called the airline. The only available flight was 2 days later. I dashed off a quick email to David and changed my plans. Now I wasn’t planning on missing the next flight out of Cincinnati, so I set three alarms for my early morning departure. It seemed like I woke up every hour on the hour that night. Finally, it was time to head out the door. I was so wired driving up the interstate. I got to the airport with more than an hour to spare. At the gate, the airline employees announced that the flight would be delayed arriving into Cincinnati. No problem, I had a one and a half hour layover in Atlanta. But then another announcement was made: due to weather conditions, no planes were allowed to land or depart in Atlanta, so my flight would be delayed in leaving. Finally, we took off for Atlanta, but by the time we had arrived, I had barely 20 minutes to go from terminal A to terminal E. Would I be able to make it through the largest airport in world and make my next flight? I sprinted off the plane with lightning speed dragging my luggage behind me. I huffed and puffed into terminal E only to find that my gate was at the very end of the concourse. I shouldn’t have even been surprised. I made it to the gate with minutes to spare. Flushed and sweaty, I straggled onto the plane. Where would I be seated now? Probably the very last row, the way things were going. But to my utter surprise, I was seated in first class...my first time ever! Big cushy seats, loads of leg room, complimentary beverages, lunch served on china, movies … Just another 4 hours until I reached the sun, sand, and loving arms of David. Looking out the window of plane I could see the calm blue of the Caribbean. 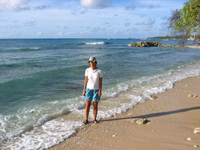 Green islands, small sand bars, and coral reefs. As we approached Barbados, we flew over the very bay where Exit Only was anchored. Resorts and small homes dotted the coastline. Within minutes we had landed. A wave of heat and humidity hit me as I walked off the plane. No more cold or grey winter weather! I was in the tropics once again. All the passengers were peeling off layers of clothing left and right. Next stop, customs and immigration. I flew through the agents in record time and literally ran out into the waiting area as I looked for a very familiar face. And there he was in shorts and a t-shirt with a huge smile beaming on his face! Could my day get any better?! As a yachtie, the only way to really get around is on local transportation. In Bali, it was mopeds; in Penang, trishaws; in Thailand, mopeds decked out with passenger seating. In Barbados, a colorful local bus is the way to get around. Painted in bright colors both inside and out, blaring reggae music and hip hop beats from subwoofers, Bajans know how to travel in style! And thank goodness, it only cost 25 cents compared to the twenty dollar fare that the taxis were offering. Just remember to bring your earplugs to save your hearing. Our bus was packed with people all heading for the capital city of Bridgetown. We careened through narrow streets lined with palm trees. Here and there I could catch a glimpse of the beach and clear aqua water. On the way to town, we passed by two wedding parties. I am sure that left David sweating! Suddenly the bustling town appeared on the horizon with steeples, streets crowded with vendors selling local produce, sun burnt tourists looking for a bit of shade, historic colonial homes, small squares grounded by statues, wide fields for cricket matches or polo, and old British outposts overlooking water. Even 200 hundred years ago Barbados was beckoning to tourists. George Washington came to Barbados in 1751 with his half brother, Lawrence. The brother died and George contracted smallpox. After this international escapade, he never traveled outside of the US again. Let’s just hope that my stay would be a little less eventful! Barbados was colonized by the British in the late 1600’s. It was one of the few islands in the Caribbean to be uninhabited. The colonists quickly discovered that the island’s climate was ideal for growing sugar cane. Plantations sprung up across the island and many slaves were brought over from Africa. 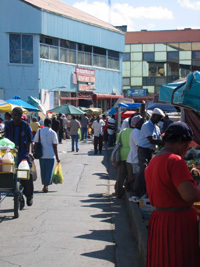 Barbados enjoyed peace, prosperity, power, and productivity for many years. It came to be known as the “Little England” of the Caribbean. The plantation owners became wealthy and powerful from the sugar trade. Many even brought seats in the British parliament. Eventually, emancipation came to the slaves in 1834. But all the power, land, and wealth remained in the hands of the British. In the 20th century, Barbados attained self-governance from England. The industry switched from sugar cane to tourism. Most of the sugar you see now is on the beaches … sugary and golden sand covered with scantily clad tourists. flock to the island's many resorts. Tourists lie in the lap of luxury with every possible amenity but behind imposing walls. The locals live in small homes made from concrete blocks or corrugated metal. Unemployment seems to be a major problem. But somewhere in the midst of all this, the sunny Bajan spirit and faith comes through. During my week in Barbados, I got all caught up on the adventures of Exit Only as they crossed the Atlantic. I spent quality time with David exploring the island using the local bus system. Talk about funky buses!! We had an ear-drum blowing adventure riding the bus up the west coast of Barbados. The music was sooooo loud! We whizzed by huge four star resorts where they say celebrities like Hugh Grant and Charlie Sheen stay. Alas, we had no luck with star sightings. I think I even heard that Tiger Woods got married in Barbados. Taking long walks on the beach was fantastic. It’s just an amazing feeling to have the sand between your toes. We snorkeled on a wrecked tug boat that was covered with coral and inhabited by hundreds of colorful fish who liked to nibble on your fingers. And I became the star of feature “snorkel-cam” video which may end up on the website. David figured out how to rig the camera through an underwater viewer to get some footage of the wreck. Let’s just say the director was rather demanding ... could you do that dive again? 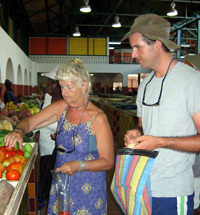 We visited the local market which sold fresh produce such as tarot root, pumpkin, bananas, and yams. And finally, there was boat work to be done, such as “jerry-jugging” fresh water from the yacht club to the boat, securing all the cans of diet coke that were available on the island, and doing laundry on the bow of the boat. The yachtie lifestyle never ends! I had a great time and oh how I am looking forward to my next visit! My Barbados adventure ended all too soon. Seven days flew by so quickly. It was really tough leaving David behind. But it was time to head back to the US for work. I will be visiting Exit Only in Trinidad for Carnival, so stick around for the coming adventure. Now it’s just a matter of toughing out the cold for the next few weeks! !